Treat yourself to the most spacious and luxurious catamaran sailing tour in Cabo San Lucas aboard the first-class 57-foot Manta. 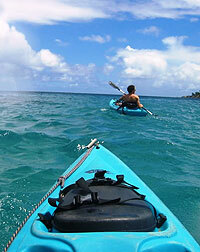 Visit one of the most incredible bays in Cabo for snorkeling, kayaking, sailing, food and fun! 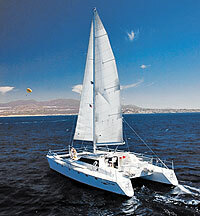 Your tour begins as you sail from Cabo San Lucas out to the symbol of Cabo - Land's End. Get great photos of El Arco (The Arch), Neptune's Finger, Lovers Beach, the Sea Lion Colony, the Cave, the Window to Paradise while your guide explains the significance of these natural attractions. Enjoy the freedom of sailing with the wind on the most luxurious catamaran in Cabo while you sip complimentary drinks from the International Open Bar and enjoy great food. We'll sail with the wind across the famous Medano Beach and Los Cabos tourist corridor, learning about the history of Cabo San Lucas, until we reach beautiful Chileno Bay. Here we'll swim, snorkel and kayak for about 45 minutes. Lunch will be served on boat as we sail back to Cabo San Lucas. Sightseeing, snorkeling, sailing, and kayaking in the warm Cabo San Lucas sunshine...Truly a day to remember! The Manta is also available for private charters for large groups. All ages welcome. Kids age 5 to 12 are half-price. Kids under 5 are free.